I currently have a very unpleasant cold, so getting something new written for the blog this week hasn't really worked out. But once I realized if you don't subscribe to my newsletter, then you probably don't know about all the writing of mine that's been shared other places over the past month, I figured I would share that content. There's a fair bit of it! There's a new home education magazine out there, with a terrific layout, and secular content covering everything from books reviews and resources, to thoughtful columns by such writers as Patricia Zaballos. While the magazine is not an unschooling magazine, plenty of contributors to Home / School / Life are unschoolers. Including myself! Or, more accurately, I'm a regular contributor the the Home / School / Life blog. I've been pleased to share two posts on that blog so far, and I'm happy with how each of them turned out! I left kindergarten for a life of school-free self directed learning, so I’ve had many years to get used to talking about home education. Some people are curious or excited, some angry or defensive, but what remains a constant is that almost everyone has an opinion on the topic and some questions to ask. I still freeze up sometimes when asked an unexpected question, or stumble over a simple explanation, but for the most part I feel that I’ve gotten pretty good at dealing with the range of questions and reactions that come from different people. We’re all familiar with the tired old myth of the “unsocialized” homeschoolers, spending their days locked inside, interacting only with their family members. I’ve certainly spent my fair share of time disputing these myths (earlier this year I even wrote a post addressing every possible misplaced socialization criticism I’ve ever heard). Yet while there are plenty of wrong ideas on home education and socialization, I find myself pondering how unschooling has impacted the friendships I make and the communities that I’m a part of now, as a 20-something adult. Not only am I now a regular contributor to the Home / School / Life blog, but also to the new website Vermicious, created by author and unschooling parent John Seven. I've only shared one piece on that site so far, but I'm excited to be taking a departure from my usual education writing, in order to explore some different topics. 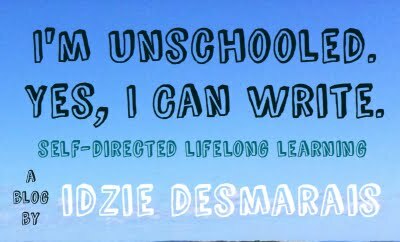 My tagline is "Idzie Desmarais learns from the rituals of life," which really sums it up perfectly. always had them around, but while I still live with my parents, this dog search marked the first one that I truly participated in as an adult. After months of searching, of countless calls and emails and visits to shelters, we finally found an Irish Wolfhound cross named Blue, with soulful eyes, a habit of leaning against your legs to better look up at you with said soulful eyes, and a deep streak of goofiness, who very quickly won all of our hearts. This year, in an attempt to help him get the exercise he needed–and hopefully socialize him out of the habit of jumping up and down at the end of his leash screaming at other dogs–we started bringing him daily to the local dog park. Now I'll leave with an excerpt from another piece of mine that has recently been shared, this time in Home Education Magazine. If you're a subscriber, check out the November/December issue! In our culture, it’s very obvious that we value certain knowledge and skills more highly than others. Namely skills that are academic and intellectual, communication skills, and social skills (somewhat less tangibly, seeing as those are harder to test). It seems everything else comes a distant second. Schools are all about teaching academic skills to the exclusion of all else (though how good a job they do at imparting those skills is very debatable). When we take school out of the equation in our own lives and families, we have the option, the opportunity, to take a hard look at what skills are valued, and decide to broaden what we personally value and encourage. But are we taking that opportunity? Too often, I don’t think we are. My family didn’t, or at least didn’t to as much of an extent as we could have. This isn’t meant to place blame on my parents; we’re each of us constantly learning and growing, and unlearning ideas that have a negative impact on ourselves and others. My parents did the best they could in the places they were at, and I’m grateful for it. But looking back, it’s very obvious that the skills they were most concerned with me and my sister acquiring were those taught in school. It was subtle, because it was unintentional, but that preferencing of academic skills, at least to some extent, was very much present. When I received a message yesterday from a prospective homeschooling/unschooling parent, I thought that I would respond in the form of a whole blog post. She brings up a couple of concerns I hear expressed a lot, so I wanted to take the time to address them in-depth! How do I as her mother give her opportunities to discover things that interest her? S. writes, concerned that as an expat, Many of the opportunities that I would have given her in the US (parks, swimming pools, zoos, museums, and so many other things) are infinitely more difficult [here]. However, there are opportunities [here] that would be impossible in the US. I worry that she may be interested in things that we won't be able to explore as fully...as we could in the US. Our learning will always be shaped by our geographic location, by our family, and by the communities we're a part of, as well as by our personal interests and goals. The world is full of an infinite amount of things that can be learned, experienced, and explored, and each of us will only ever know a fraction of those things. So I think it's kind of exciting to just work on embracing the experiences, the culture, and the community you find yourself in, no matter where in the world that might be. The unschooling community online looks pretty US-centric (even as a Canadian I sometimes feel kind of frustrated at how US-centric it is), so the examples we see can look similar in a lot of ways. I don't think that says much about what an "ideal" unschooling life should look like, though, and instead just says something about the relative popularity of unschooling in the US! There are travelling families, such as Lainie and Miro, who took their learning on the road and never looked back. There are also families like the Hewitt's who, while living in the US, very strongly value the intense on-the-land learning that's afforded by their subsistence farming lifestyle in rural Vermont. Successful unschooling doesn't depend on being able to have a specific body of experiences and resources: instead, it's shaped by our surroundings, whatever they may be. It seems that parents often feel a lot of pressure to expose their kids to everything, or at least as much of everything as they can possibly fit in. However, I think exposure is more about quality than quantity, and can simply be having an internet connection, access to both fiction and nonfiction books, some games of various types, some crafting materials... The specific interests expressed by the child can guide any further things you introduce, and beyond that, just exploring what's available near you is enough, I believe. We'll all have different experiences and different educations, but that's largely true whether or not you’re unschooled. School curriculums vary by country and by region, what's taught in a more or less exciting way varies by teacher, and what you actually remember is dependent on what seems interesting and relevant to you personally. All we're doing with unschooling is embracing the uniqueness of each person's education, encouraging individuals to approach learning with curiosity and joy, and working to value all different types of learning, not just the learning deemed properly "educational" by schools. While lack of access to time and resources can be a major impediment to unschooling, if you have those things, you have enough. How do parents balance providing guidance and a certain level of boundaries (based on their greater experience and responsibility to protect) with giving the freedom to learn for yourself? S. asks. I am truly interested in knowing how to find the balance for my family between child led learning and parental involvement in teaching. I think Pam Sorooshian said it well when she expressed that, instead of unschooling being "child-led learning," it was "more like a dance between partners who are so perfectly in sync with each other that it is hard to tell who is leading. The partners are sensitive to each others’ little indications, little movements, slight shifts and they respond. Sometimes one leads and sometimes the other." My mother and sister, circa 2010. It's a very school-based way of thinking that sees one person as a teacher and one as a student, one a leader and one a follower. In reality, unschooling quickly starts to look more organic, more flexible, and more collaborative than any ideas of people having to embody just one role (that of a learner, or one who imparts learning). Sometimes a parent excitedly learns about something alongside their kid, who finds the subject at hand fascinating, and thus initiates the exploration. Sometimes a parent will introduce a subject or activity, and be the main force behind bringing it into family life. Can it be difficult for parents to find that balance? I have no doubt it can be, and I'm sure unschooling parents would be in a much better position to talk about that difficulty with you! I know that from the perspective of an unschooler, I was pretty good at letting my mother know when I felt she was being pushy about something I had no interest in learning, and I think that's true for most kids. They're pretty good at letting you know when they're not interested! Ultimately, while I hope the words of unschoolers can be helpful to you, I think actually practicing and experiencing life learning is the only real way to feel out how it works. It's a matter of deliberately and consciously working to let go of schoolish ideas about what an education should look like, and instead focusing on the actual learning and growth happening for your child, and yourself, moment by moment and day by day. It's a difficult process--even for someone like me who spent very little time in school, yet still managed to internalize a lot of bad ideas about successful education--but an infinitely rewarding one. Wishing you all the best with whatever form life learning takes in your own family! This piece was written back in July, for a writing project that ended up being shelved for the time being. So, I thought I'd share it here instead! A look at how I value (or don't value) the uniqueness of my education. I had an epiphany about my own relationship to my learning and education recently. This came about after a couple of different minor events. First, I had a lovely exchange with a reader. They referred to me as a “successful young professional,” and continued to say that “I guess my definition of success (at least what I had in mind when I was writing to you) is that it is based on the connections you've made with the fellow people in your field, the ideas you offer to your field, and your mastery of the subject. Your blog has allowed you to make those connections and get those ideas out there. And considering that you've been unschooling for more than awhile, I assume you are, at the very least, on your way to mastery.” I was taken aback, never having been referred to as a “professional” before, and flattered that someone thought I seemed so successful. Secondly, after my parents had spent the day with some old friends they hadn’t seen in a while, I nervously asked what they’d said about me and my recent pursuits. How did they make me sound? I wondered did I come across as successful, or a real loser? The next day, in the car with both parents, I got in a conversation about school and work. I said that I couldn’t see myself taking courses in non-fiction writing through a university, because I felt for the most part they were teaching a style of writing and communication that is somewhat outdated, as I don’t think most universities (and the professors who teach at them) have fully embraced the changes that the internet and blogging has brought. I also talked about how outdated traditional CV’s and resumes are becoming, as increasingly what’s important is building some type of online portfolio, especially when showcasing any type of work that you can fairly easily do without any type of degree or diploma. Experiences are now starting to matter more than degrees, I said. Later that day, the epiphany came. I thought, wait a second, I say all this, but I don’t actually believe it when it comes to myself. Over the last couple of years, I’ve become expert at making myself sound as traditionally successful as possible. “I worked catering last year,” I say. “I’m considering going to culinary school.” I tell people “I was homeschooled,” and try to assure them that I turned out perfectly fine. I’ve become invested in making myself seem as normal as possible. I didn’t set out to do that, and in part I ended up doing so just out of a desire for privacy. Why should I expose my life and choices to the judgement of near strangers? I thought. but I think we're pretty cute regardless! That’s not the only reason, though. There’s a part of me that feels ashamed of my background. Ashamed of what I haven’t done. Namely that I haven’t worked in a “normal” job, ever, or ever been financially independent. Ashamed that, at 23, I don’t have more to show for myself. This has lead to a series of attempts to at least try and look successful, even if I don’t feel like I’m actually that successful. I suppose this says something about how deeply embedded these cultural messages are, that someone with my background in education, who regularly talks about how great self-directed learning, unschooling, and skipping college is, can so blithely fall into a trap of judging my own success by such rigid standards. Not only is this bad for my self-esteem, it’s also bad for my success. If I really believe in everything I say, which intellectually I do, then I need to actually start acting like it. I have been successful in many ways. I’ve built an extensive online portfolio, in the form of archived blog posts and a personal website chronicling various pursuits and experience. I’ve had my work published in various alternative education magazines, journals, and even a book, and have spoken at several conferences. I’ve turned down some media interviews and accepted others, and I’ve had many people express that my work has impacted their lives in a meaningful way. I’ve met and talked to people doing similar work whom I admire and who provide inspiration to me. All this is to say that I’ve created a body of work that is appreciated by lots of people in specific alternative education circles, all while feeling really positive and excited about the work I was doing. In Blake Boles’ book College Without High School, one of the suggested Zero Tuition College “assignments” is to “become a public intellectual.” Expanding on what that entails, he writes: “public intellectuals research, think, talk, and write about a social problem but don’t necessarily hold formal credentials. They spread their messages via blogs, websites, books, magazines, podcasts, videos, and other media platforms.” I told my sister, Emilie, “apparently I’m a public intellectual.” she laughed. “That sounds amazingly pretentious,” she added. It does sound more than a little pretentious, it’s true. But it’s the first time I’ve seen essentially what I’ve been spending the usual university years doing laid out as a desirable and worthwhile alternative to college or university. When I strive so hard to make myself seem more normal, my choices more conventional, and my experiences more in line with my traditionally schooled age-peers, I lose out on an opportunity to not just sound more impressive, but share the genuinely cool accomplishments I’ve made and experiences I’ve had. My unique background is an asset, not a weakness. A reason people might find me interesting to talk to at the least, or offer me amazing opportunities at the most. The reputation and body of work I’ve built for myself can continue to be both meaningful and challenging, as well as leading to money making opportunities (either through opportunities I create myself, or through a potential employer wanting to hire me based on my experience). Perhaps all this should have been obvious. Bits and pieces have been, at different times. I’ve been proud of some work, greatly valued some experiences, knew that some of what I had done was important to others. But I didn’t really value the unconventionality of my lack-of-college experience, or appreciate just how much I’ve gained by doing things differently. After having the thought that I was ashamed by what I hadn’t done over the last few years, I was quickly flooded by excitement at the idea that I could speak with pride about what I had done. Whether you’re a teen or grown unschooler, an unschooling parent, or a young adult who’s chosen to forego college or university, I think it’s important that we cultivate just such a mindset. It’s so easy to get caught up in comparing ourselves to those who are doing things more traditionally, but we do a great disservice to ourselves when we do that. In focusing instead on the value in the true uniqueness of our experiences and education, we can instead be proud of what we’ve done and how we’ve chosen to “get an education” in our lives so far. Feeling confident in the skills we’ve gained and things we’ve done outside of school seems important to me primarily because of how much better it is for my emotional well being. But it’s certainly also of great benefit being able to share that confidence with others. If you’re secure in the worth of your unique experiences, work, and skills, you’re going to be better able to present yourself and your accomplishments to the important people in your life, and better able to turn your skills into ways to earn money, make important connections with people doing work you admire, and build a life that feels truly successful to you.